Today’s post is part of a multi-blog project, hosted by Inspired By Familia, the 21 Days of Gratitude Challenge. Over the last 19 days bloggers have been reflecting back on what they are most grateful for. Today, the baton has been passed to me. As I sat and thought about what I am most grateful for, a few obvious things popped into my mind. Of course, I am grateful for my children, my husband, my many family members and friends. Those people are the foundation of my life. I also considered writing about the gratitude I feel regarding my health and my home. However, as I was deciding what I should focus my writing on, Typhoon Haiyan hit the Phillipines and my thoughts abruptly shifted. It became clear to me that it is the empathy in the hearts of people, the desire to help others in times of absolute crisis, that I am truly grateful for. As I sat in the comfort of my living room, watching and reading about the horrendous aftermath of Typhoon Haiyan, I wondered “what I can do?” What can our little family do? So far away from the disaster. On the other side of the world. How can we possibly help? What difference can we make? These same thoughts ran through the minds of other people watching. 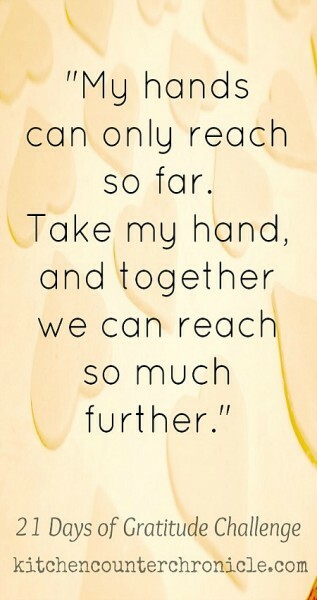 My hands can only reach so far. 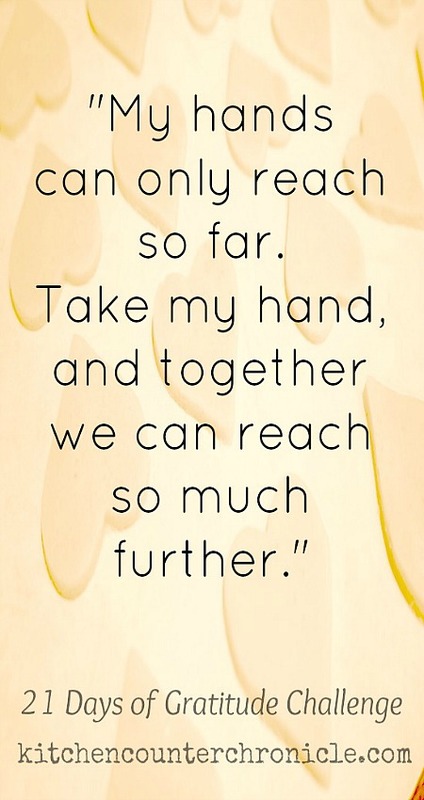 Take my hand, and together we can reach so much further. It is the coming together of individuals and communities that we rely on in moments like these. The kindness of one person builds on top of the kindness of others. The innate empathy and desire to help that resides inside the hearts of so many people around the world is a beautiful and powerful force. Millions of dollars and countless volunteer hours have been donated to help complete strangers…people whose names we might never know, whose families we might never meet. I am grateful for this force that makes us reach out, join together and help. I am grateful for the efforts of the Red Cross, World Vision, Save the Children and UNICEF. I am thankful that these organizations exist and are supported by everyday people. These organizations are the hands helping around the world, where our individual hands could never reach. So, while I am grateful for all that I have, I rest a little easier knowing that if I were to lose everything – someone, somewhere would reach out their hand to offer their support…and that is what I am truly grateful for.